“Unless we create more options for people at the middle- and lower-income levels, we are going to be seeing that people have fewer choices and that they’re forced into options they don’t want,” she said. The issue, Molinsky said, is that when baby boomers begin to develop physical limitations, there won’t be enough housing to allow them to remain independent, whether in a one-story ranch house, a condominium building with an elevator, or an assisted living facility that manages their routine housekeeping chores. In the Boston suburb where she lives, for example, a modern condo building conveniently located near public transportation is often more expensive than the house the person wants to sell. Many retirees struggle financially, because they haven’t saved enough during their working years to supplement their Social Security checks. So even if their living situations don’t change, they may have difficulty paying for their house or apartment once they run through their scant savings or after years of inflation seriously erode the value of their pensions. One indication of retiree’s resilience, however, is that they are increasingly getting financial relief by moving in with family or friends. Today, 11 percent of people over 65 are living with parents, offspring, siblings or other relatives. Shared living arrangements with non-relatives are also more common. The burden of housing costs is greatest for renters, who tend to have lower incomes than homeowners. But the financial pressures on both groups intensify as they get into their 80s – albeit for different reasons. The issue for renters in urban areas is that rents in recent years have increased two times faster than the cost-of-living increases in their Social Security checks, consuming more and more of their disposable income over many years of retirement, Molinsky said. Older homeowners can also get relief if they finally pay off their mortgage. However, half of homeowners over 55 are currently carrying mortgages, compared with a third in the late 1980s, according to the Center for Retirement Research, which sponsors this blog. To help low-income seniors live independently, rent subsidy programs would have to increase, Molinsky said. Middle-income seniors would have better options if developers were building affordable assisted living facilities. She points to organizations like 2Life Communities in Boston (previously the Jewish Community Housing for the Elderly). It uses innovative financing and low-income tax credits to carry out its mission of building high-quality, affordable housing. However, creative programs like this are extremely rare. “We need more of them,” Molinsky said. My wife and I have been talking about this a lot recently. We have aging parents, who will soon enough need some help. I suspect our folks will eventually join that 11% and they will be living with family members (us). Taking care of elderly parents is not only the right thing to do, but it also seems to be the fiscally responsible choice. 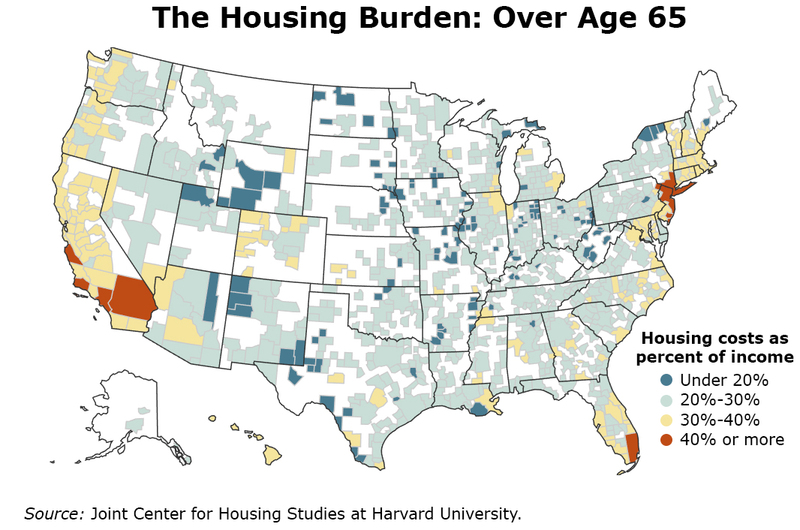 Senior housing in our neck of the woods is ridiculously expensive! First, living on borrowed money may be OK for the short-term, but — if seniors have the long lives they hope to have — they will find that compound interest can greatly mount up, doubling a debt in 10 years at 7.2%, quadrupling in 20 years, etc. Those debts will take money that would otherwise go to friends and family and charities. Second, subsidizing seniors — to stay in homes they do not really need — conflicts with the goal of having affordable housing for everyone. Without the subsidy, more seniors might sell to younger families, or at least rent out portions of a home now too-large-for-need-and-affordability. Even selling or renting to older families might free-up those peoples’ other housing for other people. Media reports suggest that the unexpected cost of guaranteeing reverse mortgages runs into the billions, money that could be more wisely and effectively spent, rather than being wasted counter-productively. On your first point regarding debt incurred on a reverse mortgage: Unlike a HELOC credit line, the maximum debt level owed is the value of the house at the time of eventual sale when owner dies or leaves property. I’m so grateful to live in a Preservation of Affordable Housing (POAH) community. There is no way we could afford to live anywhere at market rates. As it is, we live on Cape Cod, MA which is extremely costly. I hope this company continues to build amazing homes/apartments for people of all ages.